44 Commercial Real Estate & Properties in Bathurst are listed in 6 categories. We have 22 Retail ShopsLease , 15 OfficesLease , 4 Industrial Warehouses Lease , 1 Commercial FarmsLease , 1 Other Commercial PropertiesLease and 1 ShowroomsLease . Cbd First Floor Private Office Space $440 per week plus gst + ..
Will be freshly appointed with new carpet and painting. Located on a busy corner location overlooking Machattie Park. Welcoming reception area with room for approx 3 4 offices, bathroom and kitchen facilities. Easy off street parking . This property is visually prominent giving you great exposure for your business. Plus share of outgoings. Call Louise today to arrange an inspection. Millthorpe is a picturesque and historic village set amidst gently rolling hills.and is located between Orange and Blayney and just 30 mins from Bathurst. On offer is a fantastic opportunity to have great visual presence in the main street of Millthorpe, this store is located on the ground floor of a beautiful historic building, giving the store approx 95 sqm of retail floor space, complete with air conditioning, kitchenette and shared toilet. Call today to arrange your personal inspection. Fantastic opportunity to secure your business approx 400 sqm of prime retail space in the heart of Bathurst CBD in William Street. This premise is open plan with approx 340 sqm of retail space, with additional rear storage and amenities area approx 62sqm. This premise also benefits from a large rear yard with ample secured parking or rear deliveries. Give your business a well presented and strong presence in the busy Bathurst Trade Centre. This property has alot to offer. Approx 442 sqm of working area, on a large block approx 1654 sqm. Includes a welcoming reception area, with showroom area, and 3 enclosed offices, with reverse cycle heating/cooling approx 108sqm. Also gives you a comfortable kitchen area and amenities, with both toilet and disabled toilet area. There is also an additional enclosed work area of approx 45 sqm. Complete with two roller doors to access the warehouse area. There is also a enclosed yard area of approx 584 sqm. Call today to arrange your inspection. Wont last long. Located in the busy and thriving Keppel st precedent. Offering larger retail premise, office space, and rear workshop/ storage area. Located opposite the Bathurst City Library, featuring kitchenette and own amenities This property is well worth an inspection, large premise at very affordable price. Rear parking for two cars is also available. Approx 236 m2. Well located retail premise in the prominent Scots Centre in George St. Offering approx 8m street frontage at the entrance to the Scots Centre. Approx 80sqm with kitchenette/office area. Shared toilet facilities. With its excellent CBD location, this property won't last long, call today for more details. Close To Cbd $550 p/w + GST + $91.42 p.. Located just blocks from the CBD is this well presented office/workshop premise. Located in busy complex offering 3 off street parking areas, air conditioned front reception room with adjoining office and kitchenette room approx approx 45 sqm, board/meeting room and storage room approx 45 sqm. Separate mens and ladies toilets with shower in mens area. Large high auto roller door to workshop approx 3.8 high x 3.6 wide, with led high bay lighting to workshop. Workshop area approx 230 sqm. Three phrase power is also connected. Rent + outgoings. + 100% water consumption charges This premise will not disappoint. Call today. 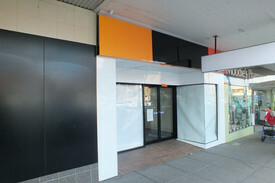 Impressive And Modern $2000 per month +GST and ..
Well presented premise located in the popular Bathurst Trade Centre. 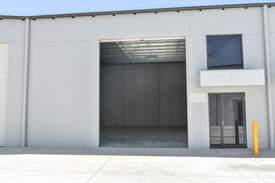 Offering approx 300sqm of storage area with easy access from a auto roller door approx 4 m wide x 5 meter high. This property also offers a wash bay area under the awning. Parking is also available . This property is located at the rear of the street front premise in a secure shared yard. Ideal for additional storage, or business owner alike. Call today to arrange your inspection. Rent + some outgoings. Call today and arrange you inspection of this brand new premise, in new modern complex. 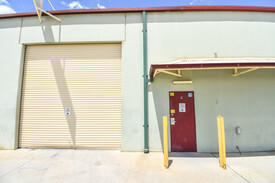 Offering approx 151 sqm of warehouse area, with large high clearance roller door. Located in a secure gated complex with off street parking. The possibilities are endless. Call today. This new property is sure to impress. Rare opportunity to secure a unique property in busy Keppel st. Offering large retail space with equally large store room total area approx 328 sqm. Off street parking for two cars. Located near the corner of Keppel and William St. The possibilities are endless. Call today to arrange an inspection. Standout Corner Location $3750 per month plus GST ..
Fabulous location situated on the busy corner of George and Keppel Street, this property is well worth an inspection. Offering visibility for your business with large display windows on 2 streets. This property is well presented, and has loads of character. Complete with quality fittings, disability accessible toilet, separate Men's Ladies toilets, entry from either Keppel or George Streets, and an off street shared car park which can accommodate up to approx 6 cars. A grease trap is also connected to the property, ducted air conditioning and large cellar for storage. The premises has been a well known beautician for a number of years, but the new possibilities could be endless. A+ Opportunity Highway Exposure $5000 per month +GST+outg..
113 Durham St (great western highway) Corner Rankin St. Prime Commercial Highway site in the heart of Bathurst City with thousands of vehicles passing every day. Located on the Corner of Rankin Durham St with approx with 38 metre frontage to Durham St (Great Western Highway). Offering approx 270 of retail/office/showroom with toilet facilities. Large 3 meter sliding door to internal of premise. Building Area: 270 (approx.) Land Area: 1476 SQM This is a unique piece of prime commercial property on the highway. Offering two road frontages. Call today to arrange your inspection. Make the move today. This retail and workshop/storage premise is located on Highway Frontage, this property ticks all the boxes. 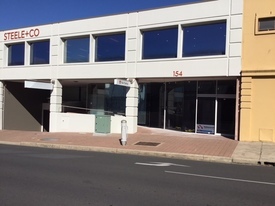 Offering ample off street parking, retail area approx 231 sqm with wide frontage to highway, plus office and warehouse area approx 440 sqm which can be accessed internally via showroom or externally via ramp and stairs, with handy additional storage/ office area approx 114 sqm approx, which is located on ground level. This property is perfectly situated on busy Stewart Street, next door to Seven Eleven. Flexible leasing terms. Can be lease as one complete premise, or can be negotiated as smaller area. Versatile Cbd Location $4583.33 per month +GST a..
Offering this versatile highway location just blocks to the heart of the CBD. Offering large showroom/display area, with amenities, plus large rear storage area, clean and fresh ready to go. Complete with 12 off street car parking places. Approx 270 sqm in total. Great presence in a fantastic location. Ready to go, call today to arrange your inspection. Rent plus portion of outgoings. Well located retail,space in busy Bentinck St. Inspect today, and move in straight away. Offers two rear car spaces, small office area, retail space with kitchenette and toilet facilities. Approx 137.19 sqm on ground floor with additional first floor storage area approx 61.5 sqm . Located in busy Bentinck St, is this stand out property with options. Can be leased as one premise approx 349 sqm featuring 4 rear car spaces, first floor storage area, rear ground floor storage plus amenities and kitchenette facilities. Also features a wide plus a 10.8 m street frontage. The property could easily be split and leased as two smaller premises. Proposed Shop 1 approx 150.47 sqm with two outside car spaces and rear store room approx 32.7 sqm with roller door. Proposed shop 2 approx 137.19 ground floor area with additional first floor storage approx 61.56 sqm plus two rear outside car spaces Call today to arrange an inspection and discuss options. Busy Bentinck st has this prime retail space on offer for lease. Featuring approx 150.47 sqm on total space consisting of open plan retail area, kitchenette and disabled toilet and approx 32.77 sqm of rear storage area or additional car space. Plus two rear outside car spaces. Call today to inspect and start negotiations for your new lease. Eco Friendly Cafe Opportunity $2170 per month + GST+ tr.. Potential to secure a fabulous business opportunity to have your own Eco friendly Cafe with established commercial kitchen and brand new appliances. Approx 66 sqm with flexible opening hours between 7am 9pm plus potential for after hours catering. 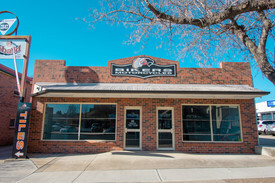 This premise is located within the CSU campus, surrounded by numerous businesses, across the road from The Lands and Property Information and The Bathurst TAFE Campus. Family friendly secure outdoor play area and sunny outdoor eating area. Ample customer parking. The possibilities are endless. Very well presented retail space in the heart of the CBD located in new Victorian style building. This property offers two off street car spaces, new air conditioning kitchenette and disabled toilet. Grease trap is also available. Approx 116 sqm. Call today to arrange an inspection and negotiate your new lease. This property offers fantastic highway exposure with plenty of off street parking, making it an easy stop for clients or customers. This property would be ideal for both retail or office area, with small rear yard and toilet and amenities. Aprox 92 sqm. Call today and arrange your inspection. Previously home to the popular Tommy's Restaurant comes this rare opportunity to lease a large scale space, in an ideal CBD location, on the first floor, overlooking Kings Parade Park with a large wrap around balcony. Large function rooms, industrial kitchen with grease trap and bar area. This prominent building is home to long term tenants and is a well known landmark location. Offering affordable rent, and negotiable lease terms, this will not last long. Call today to arrange your inspection. Approx 150sqm. Fresh new look this property is located on the ground floor of a recently renovated impressive building in the heart of the Bathurst CBD. With its fresh new look this property would be ideal for office or retail space. Complete with air conditioning, kitchenette and toilet. One exclusive car space is available. Approx 95 sqm. Prime location office space, located in busy Howick st, across the road from the Bathurst Post Office. Offering welcoming reception area, numerous existing offices kitchen/meals room, storage area plus own amenities. 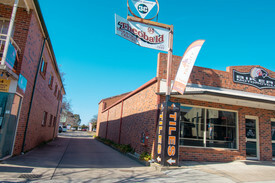 This location has been home to successful businesses. currently vacant, its ready to go. Approx 180 sqm. Located in the heart of the CBD and close to all parking areas. Rent plus share of outgoings. Opportunity to secure a great size office area with numerous office and meeting rooms already in place with large welcoming reception area. Located in the well known Bolam Centre on the corner of George and Howick Streets with plenty of lovely natural lighting. This property offers approx 150sqm of area, with shared kitchen facilities and amenities. Call today to arrange an inspection. Plus share of outgoings. 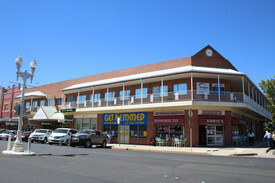 Prominent - Cbd Location $3918.75 per month incl G..
Easy to find CBD office space just a short stroll to the Post Office. This premise is approx 171sqm, offering heating and cooling throughout, open plan office area, meeting room and front office area. Kitchenette and own toilet facilities are also available plus two car spaces. Wont last long, please call today to arrange and inspection. Large Cbd Office Area $7768.75 per month incl G.. Impressive ground floor office space in the heart of the CBA. Offering approx 339sqm of office area complete with open plan area, welcoming reception area, meeting rooms, kitchenette, toilet facilities and secure parking for four cars. This property also has heating and cooling throughout. Call today to arrange an inspection. Rent plus percentage share of outgoings.